Article by Writing IE Admin © 10 April 2019 writing.ie . Children’s Books Ireland is supporting Drop Everything and Read (DEAR) challenge as part of EUReads campaign. Children’s Books Ireland is supporting Ireland’s fourth national Drop Everything and Read (DEAR) challenge taking place at 12 noon on Friday April 12th. The main aim is to promote reading for pleasure by encouraging everyone to take time out to read. A simple but effective idea to have as many people as possible read at the same time on the same day. Work should be put down, computer screens turned off, school-texts put away and everyone will be encouraged to pick up a book, magazine, newspaper, e-book, audio book, etc. and to read quietly, or indeed be read to, for twenty minutes. Currently over 97,000 groups and individuals across the country are registered to take part on Friday, marking an amazing 55% increase on 2018. 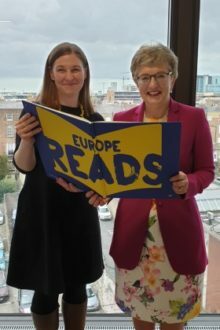 In partnership with Children’s Books Ireland this year’s DEAR Challenge will also be the official EURead campaign event for Ireland in 2019. EURead is a consortium of reading promotion organisations working together on a joint campaign to present to the EU commission in October, highlighting the reading and literacy challenges our countries face and urging the commission to make reading, its structures and its supports a funding priority when they are setting the budget for the next eight years. The National DEAR Challenge is supported by a range of organisations, including Children’s Books Ireland, the JCSP Library Project, City of Dublin ETB, LAI Youth Libraries Group, Laureate na nÓg, CDETB Curriculum Development Unit, Poetry Ireland and many more. DEAR is open to all. Schools, community groups, individuals, families and workplaces can register to participate at www.jcsp.ie –where you will also find information, ideas and inspiration. You can follow on Twitter @dear_Ireland and share your comments, photos and video clips using the hashtag #DEARIrl and #EUReads.